I'm going to send an e-mail to the seller and see if I get a response. This is how they build a muscle car in Australia. It's pretty damn impressive. Even more impressive is that this car is in the US. Holden is General Motor's Australian subsidiary. GM never sent any Holden badged cars to the US, but the very good Pontiac GTO and G8 of the last decade were rebadged Holdens. 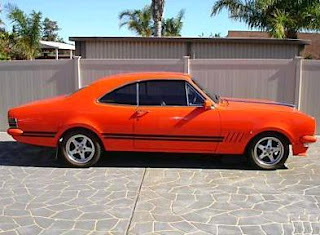 The first generation Monaro was introduced in 1968 and was built through the 1970 model year. 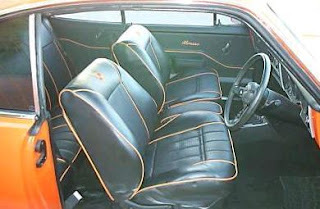 In 1969, it was based on the Holden "HT" car, which - for comparison - had the same 112" wheelbase, but weighed a few hundred pounds less lbs less than a 1969 Chevy Malibu. 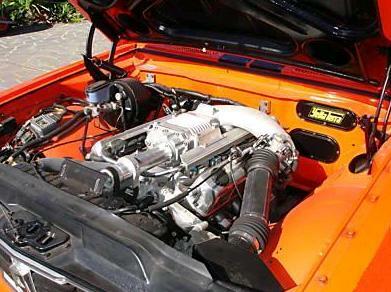 Available engines throughout the years ranged from a 2.6 liter I6 to a 5.7 liter Chevy V8. The engine on this car has been built. It includes a Terra Charger Supercharger made by Australian company Yella Terra specifically for this engine. It also has fuel injection, a hot cam, a stainless steel exhaust, a K&N filter and just about everything you would expect to find on a modern performance modified engine. While I can't honestly say I recognize all the Australian parts and companies mentioned in the ad, it all sounds - and I expect is - very impressive. The body, believe it or not, is close to stock. 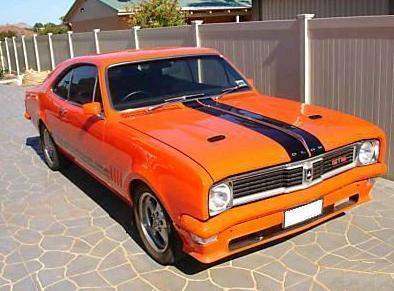 The color, stripes and hood scoops were part of the Monaro package. The few changes I can see include body colored bumpers and an aftermarket front air dam. The seller does not mention how long this car has been in this country or how long he's owned it. He also doesn't mention the condition of the body or interior but, based on the pictures, they both look very nice. There is a reserve price and no Buy It Now option, so I'm not sure how much the seller is looking to get for this car. At the end of the listing, after offering a shipping price to Australia and Japan (No! Don't do it! Keep it in the US so I can maybe see it someday! ), he writes "Only 12k", which I guess could mean $12,000.00. Located in San Jose, CA, click here to see the eBay listing. This one is setting my scam alarm off. The pics don't look like Cali, seller has zero feedback, and the $500 International shipping is wayyyy too good to be true. yep, it's a scam. Here's the real car for sale. Even though it's a shame that this appears to be a scam, it was still interesting to read about a model I was not familiar with. I think it looks rather hot, especially with the colors used on that particular vehicle. mate what do you mean here's the car? [your alarm needs a battery]....if I've read it right this says its advertised for $9,000 [with a yahoo address too] ....they havent been near that price for 20 years...that wont even buy you a wreck found in a creek. for everyones peace of mine a simple trip to wikipedia may throw some light on the collectability and price of these , well at least i think this was around 2007 [admittedly in the middle of the rediculous jump in price caused by the Baby Boomers retiring with oodles of cash to splash around on toys..
now a days, the price is less cut and dried [probably dropped a lot but not that much hah. ]...but you can see the reason why that other advert is scary. check out the price of car on this wikipedia page.